Agent (drug) billing is reasonably complex. When you administer drugs to patient, your have to submit a claim. This claim should have appropriate HCPCS code information. If you have a system which provides all this information, you can have a more efficient billing process. Our oncology content management system covers both clinical and financial aspects. 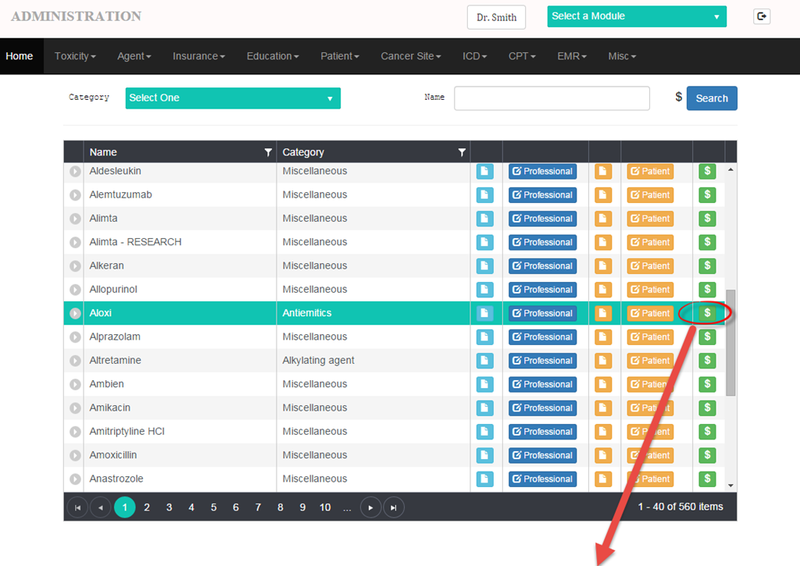 The following screen shot shows how you manage agent information in our oncology content management system. Every drug has different billing unit formation and determines what HCPCS code should be reported in your claim. If you have this information easily accessible. The following screen shot shows how you can capture detailed billing information and used in your billing process. Note that, Aloxi billing information is taken from internet for demonstration purposes only. In addition to this description information, our system helps to manage the mapping of appropriate HCPCS code to help creating a very powerful super bills. This super bill will cover drugs and associated CPT codes used for chemotherapy administration. With a powerful content management systems like ours, you can accomplish many things more efficiently.